Yellow wingstem or yellow ironweed (Verbesina alternifolia) of the aster (Asteraceae ) family is found in the U.S. from Texas to Nebraska to Wisconsin and thence east and south. In Arkansas, the species is found throughout much of the state, though is less frequent in the Mississippi Alluvial and West Gulf Coastal Plains. The genus name perhaps alludes to a Verbena-like appearance, although the exact etymology is unknown, while the specific epithet refers to the plant’s mostly alternate leaves (note, though, that some plants may have a few or primarily opposite leaves). 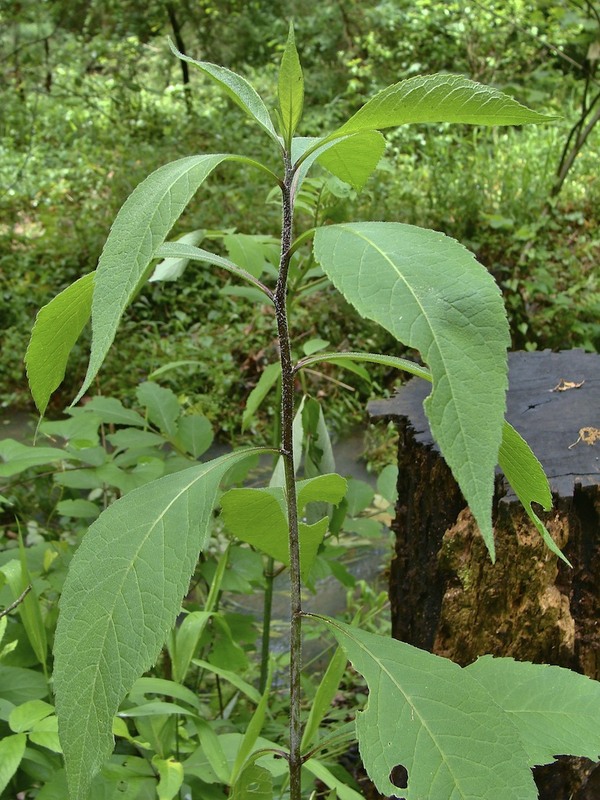 The common name “yellow wingstem” may be confused with other species in the genus (see end of article for a short discussion on the other species). Yellow wingstem is an herbaceous, erect, clump-forming but sometimes rhizhomatous perennial that reaches heights of 4 to 8 feet. It occurs in fertile, sandy to rocky mesic soils of floodplains, woodlands, thickets, ditches and prairies. 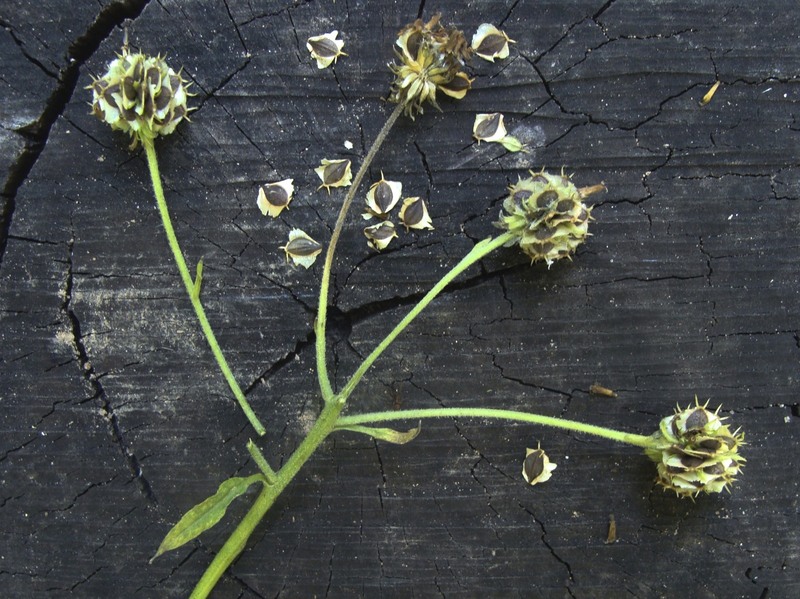 Its scabrous (rough-hairy) stems may be winged, partially winged or without wings. Stems are light to medium green with purplish coloration at leaf nodes or along entire stems. Stems are branched in the inflorescence only. Upon flowering, stems can become less erect. Lanceolate to narrowly ovate leaves, about 10 inches long and 2½ inches across, taper from mid-leaf to both an acute to acuminate point and a narrowly winged petiole. Lower leaves may be opposite while upper leaves and those in flowering branches are usually alternate. 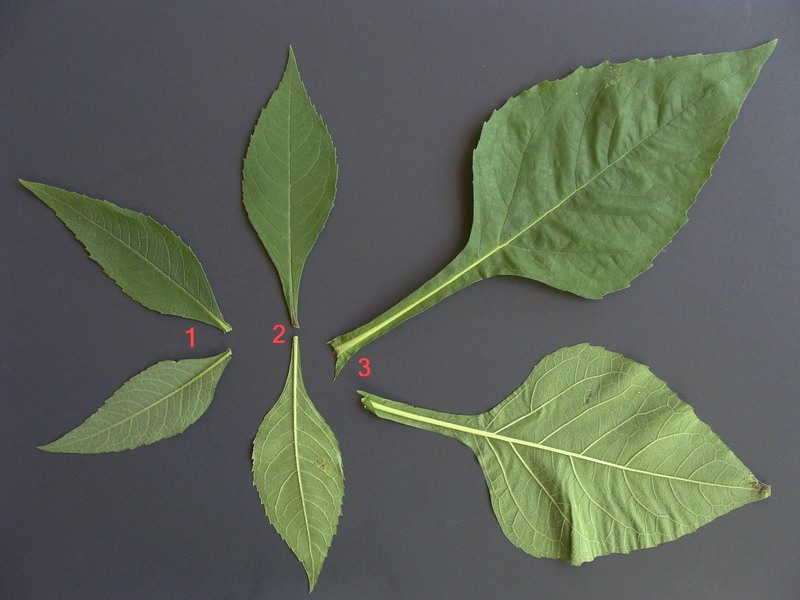 Leaf margins are smooth below mid-leaf and slightly serrated above mid-leaf. The upper surface is dull medium-green and scabrous while the lower surface is light green and less rough with white hairs along major veins. 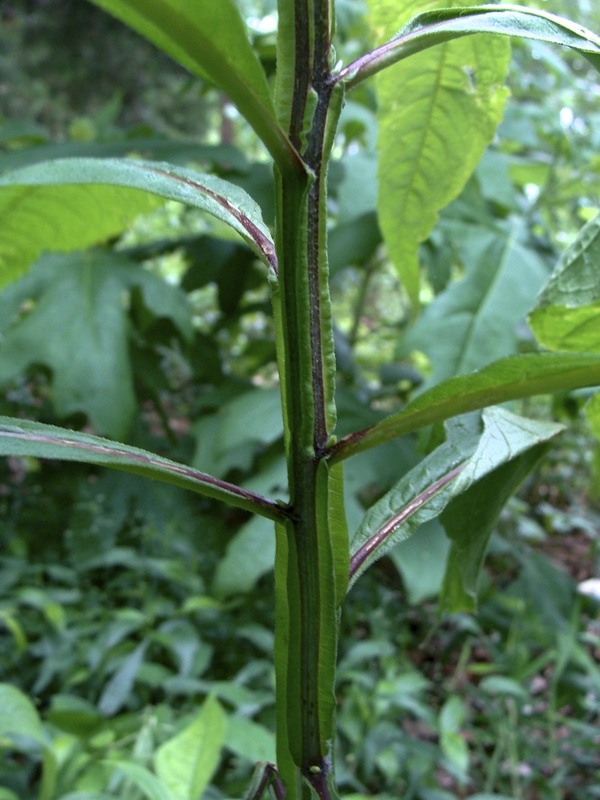 When stems are winged, narrow bands of leaf blade tissue extend down the stem (decurrent) to the leaf directly below. If stems are not winged, leaf blade tissue stops at the stem (sessile leaf) or a petiole may be present. Photo 1: This yellow wingstem plant, which does not have wings, has a scabrous stem with purple nodes and upper stem. Also on this plant, lower leaves are opposite. Photo 2: This winged plant is nearly hairless. Purple coloration between green wings extends along leaf rib. In late summer to early fall, stems have a loose panicle of composite flowers on branches near the top of the plant. A few to a half-dozen or so flower heads on scabrous peduncles occur on each branch. Flower heads are 1 to 2 inches across, each with up to 10 reflexed, yellow ray florets (ligules) and several to 30 fertile disk florets. Rays, rather haphazardly arranged, have a notch at the end. Disk florets consist of five-lobed, tubular extended yellow corollas that have sharply reduced green bases. Disk florets, with five stamens with white filaments and purple anthers, are tightly compressed so that they appear to be one. Stamens initially totally enclose the pistil so that, when stamens emerge from the corolla, the pistil is not evident. As a flower further matures, stamens wilt back into the corolla tube, the pistil emerges from the corolla, and the stigma becomes bifurcated (divided). Corolla tubes of matured flowers, with enclosed wilted stamens, quickly drop off the inferior ovary to expose developing green fruits. Each flower head is surrounded by a calyx-like involucre composed of several rows of loosely arranged, elongated, acuminate phyllaries (bracts). Flower heads, excluding the rays, have a spherical shape. Photo 3: Long, widely spreading branches of the inflorescence and extended disk florets on spherical flower heads are characteristic of the plant. Photo 4: Flower head on left displays haphazard ray floret arrangement, tubular disk florets, compressed stamens and forked stigmas. 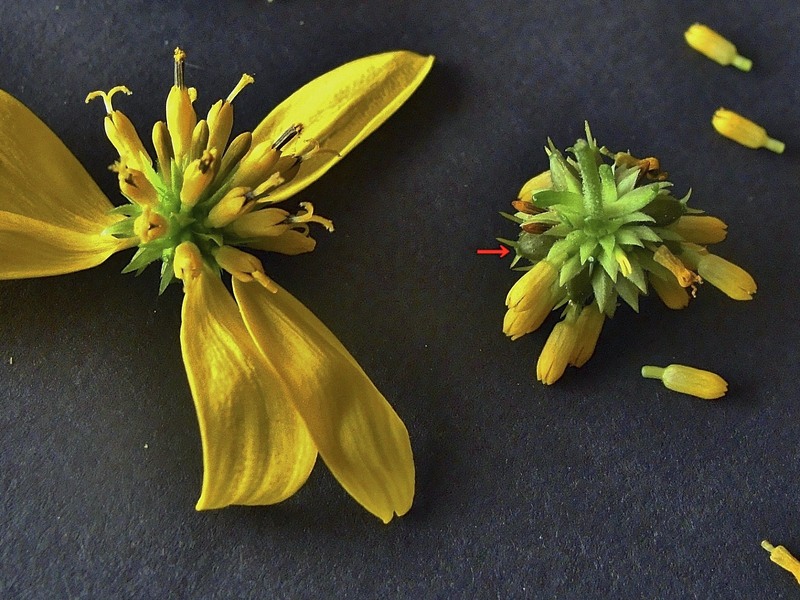 Flower head on right (upside down) shows phyllaries of involucre and developing one-seeded fruit (red arrow) just after corolla tubes dropped off. A single indehiscent (not splitting), one-seeded fruit (achene) is produced by each disk floret. Achenes have a flattened ovate shape with tapered ends, side wings and two short awns (bristles) at the tip. Mature achenes can be easily removed by brushing against the awns. Loosened achenes may be dispersed by strong wind or carried by birds and other animals. Photo 5: Spherical nature of flower head remains as achenes mature. Drying achenes easily brushed off head are at upper center of photo. For a garden, this plant can be easily grown from seed. Considering the plant’s height and its tendency to sway over with flowering, yellow wingstem is probably best suited as a background planting in a larger natural garden. It does best in moist soils, but can survive some dry periods. It is a good food source for insects and birds. It is not favored by deer. Yellow Wingstem or Yellow Ironweed (Verbesina alternifolia) which may or may not have wings and blooms in late summer. Yellow Crownbeard or Yellow Wingstem (Verbesina helianthoides) which is always winged and blooms in early summer. Frostweed or White Crownbeard (Verbesina virginica) which is always winged and has white flowers. Rayless Crownbeard or Walter’s Crownbeard (Verbesina walteri) is a rare native found on Rich and Black Fork Mountains in Polk County; it resembles Verbesina alternifolia but has white flower heads and lacks ray petals. 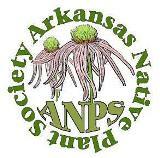 Cowpen Daisy or Golden Crownbeard (Verbesina encelioides) is a western species believed to be introduced to Arkansas at a few widely scattered locations; it is a yellow-flowered, short-stature annual with auricles on the leaf bases and lacking stem wings. Leaves of Verbesina alternifolia and Verbesina helianthoides have a similar appearance. Photo 6: Upper and lower leaf surfaces: #1 – Verbesina alternifolia, #2 – Verbesina helianthoides and #3 – Verbesina virginica. 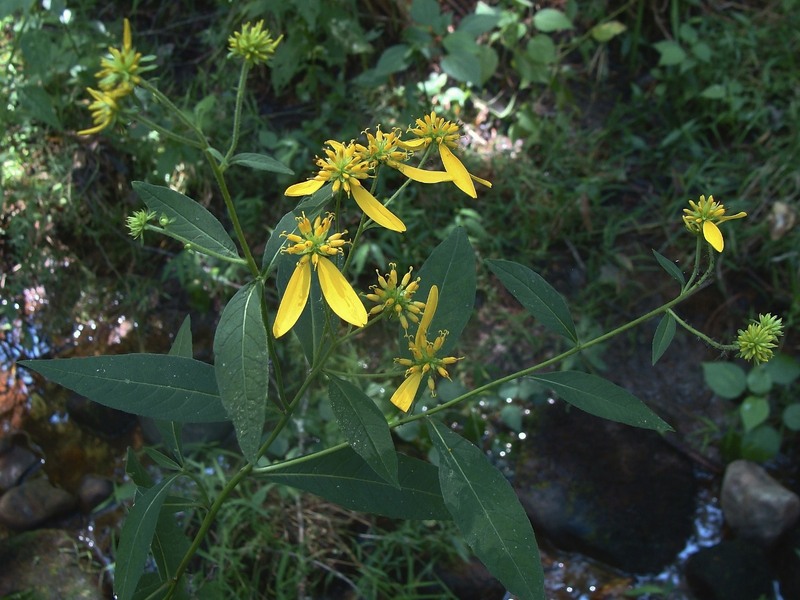 This entry was posted in Know Your Natives, Native Plants, Wildflowers and tagged Asteraceae, Know Your Natives, Verbesina, Verbesina alternifolia, Yellow Wingstem. Bookmark the permalink.